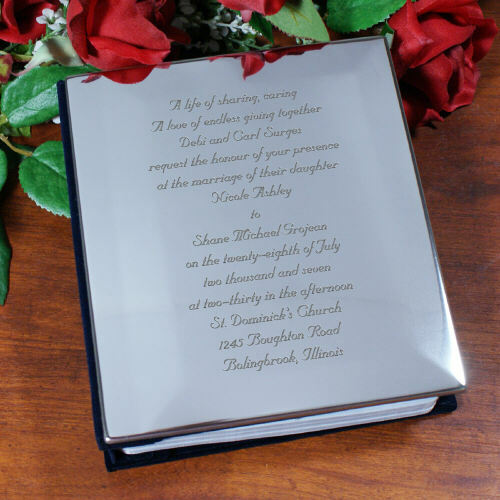 With our Engraved Silver Wedding Photo Album you are able to personalize it with your wedding invitation. Inside this personalized photo album treasures many memorable pictures that will never be forgettable. Personalize the Wedding Photo Album with any wedding invitation text or write your own message for any special occasion. Just type in the wedding invitation below, up to 14 lines and up to 50 characters max per line. Please enter a backslash to separate each line. Photo Album measures 5.75" x 6.50"
I loved the idea of an engraved keepsake for my parents as a gift at my wedding. While I do love the sentiment of the gift the engraving is so difficult to read. The mirrored element of the front cover makes it impossible to read unless it is titled in exactly the right angle under the right lighting. Very disappointing. Just what we wanted and shipped quickly! Personalized Wedding Albums make great engraved wedding gifts. If you are looking for something extra special for someone's Anniversary try this Wedding Album with their original invitation and fill a few pages with their wedding photos. A real treat for a 1st Anniversary gift or to help celebrate Silver and Gold Anniversaries.